The day is near at hand when the doctor will no longer be engaged to patch up the sick man, but to prevent him from getting sick. He will visit families, examine the premises, inspect factories and shops, and give instruction to his patients how to keep from getting sick. Each family will select its doctor and pay him so much a year per capita. The doctors will not lose by the arrangement, either. the human body’s ability to heal itself, and balancing the body, mind, and spirit with the environment, as well as encompassing practices such as acupuncture, biofeedback, faith healing, folk medicine, meditation, megavitamin therapy, and yoga. Many people don’t accept the efficacy of alternative forms of medicine, though, so having a famous and respected scientific commentator seemingly anticipate the rise of holistic medicine helps to lend credibility to that field, hence the popularity of the above-cited quote regarding the nature of the “doctor of the future” which is commonly attributed to renowned inventor Thomas Edison. 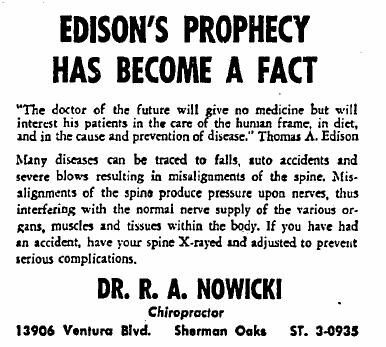 The doctor-of-the-future statement is popular with American chiropracters [sic]. It appears on their stationery and in frames on the walls of their offices. But it appears nowhere in the writings of the great American inventor. Neither the Palmer Chiropractic College archivist in Davenport, Iowa, not researchers at the Edison Historical Society could locate it. 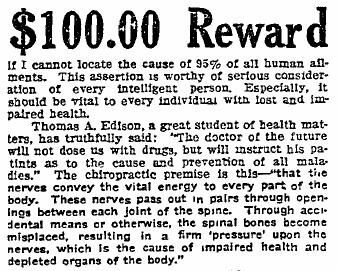 In the early 1980s the American Chiropractic Association offered a small reward to anyone who could provide the source in Edison’s writings, but to date there have been no takers. Since the ad appeared well within Edison’s lifetime (the famous inventor passed away in 1931), the quote could not easily be dismissed as words that had been put into Edison’s mouth after his death (when he was no longer around to deny having said them). The original statement, if it existed, might be worded in a significantly different fashion than the form in which it was now commonly circulated. “The doctor of the future will give no medicine, but will instruct his patient in the care of the human frame, in diet and in the cause and prevention of disease. “They may even discover the germ of old age. I don’t predict it, but it might be by the sacrifice of animal life human life could be prolonged. The bolded passage is rendered slightly differently in various newspaper accounts (e.g., “The doctor of the future — there will always be doctors — will instruct his patient how to care for the human frame and how to diet himself instead of giving him medicine”), perhaps due to the vagaries of reporters’ having to transcribe an oral statement as it was being spoken (or later from memory), but it’s clear that the gist of the statement in question was widely and contemporaneously reported as something Thomas Edison himself said in late 1902. However, one should keep in mind the context in which Edison made this statement. He was speaking at a time when very little effective “medicine” existed: the drugs used for alleviating illness in his era consisted primarily of useless (and often harmful) “snake oil” concoctions, toxic bromides, and “patent medicines” based on narcotics such as heroin, opium, morphine, and cocaine. Aspirin, which might be considered the very first safe, effective, non-addictive drug to be widely used, had been introduced only a few years prior to Edison’s remarks, and the development of antibiotics was still several decades away. In retrospect, therefore, it’s hardly surprising that a scientist speaking at the dawn of the 20th century might have declared medicine to be “played out” and instead have advocated a focus on health maintenance, disease prevention, and surgical treatment over a reliance on crude drugs. New York: Oxford Univ. Press, 1989 ISBN 0-19-506469-0 (p. 23-24). 31 December 1902 (p. 49). 2 January 1903 (p. 1). 10 December 1908 (p. 6).